This week begins the much anticipated Copenhagen Climate Conference in Denmark. Leaders, delegates, officials, and journalists from 192 countries will embark on the 2 week summit to work towards a new protocol to replace the divisive Kyoto Protocol that expires in 2012. Although we are not officially abiding by the Kyoto Protocol, leaders from around the world are looking for us to lead the way in garnering promises to reduce carbon emissions from developed countries such as China and India and developing countries such as Somalia and North Korea. Also, developing countries have made it clear that they will not agree to any emissions reducing standards without substantial help from the US and other larger more prosperous nations. This is where the story gets real deep. We must understand that the Climate Conference is based on a number of assumptions. 1) there is global warming, 2) it is manmade, 3) it will inevitably lead to catastrophe for the world if not addressed immediately, and 4) carbon dioxide is the culprit and must be capped. Although most rational folks can agree that the 20th century has witnessed changes in global climate patterns, many questions remain as to the root cause of the problem and to what degree we should willingly go to combat these changes, especially during a time of global recession. President Obama and his administration, as well as much of the liberal demographic in our country and in the world believe the science is proven and that manmade carbon emissions are imminently responsible for global warming trends across the globe. Never mind the fact that these warming trends are up for dispute, or the fact that the key player in building evidence for the UN’s certitude regarding manmade global warming is currently being investigated, these players are pushing for tougher policies to curb carbon emissions, whether the agreement be binding or not. President Obama has already pledged to reduce our domestic carbon emissions 17% by 2020 and a ridiculous 83% by 2050. Those promises would essentially take our carbon emissions per capita back to just after the Civil War. Talk about Hope. What have two of the worlds other largest CO2 emitters pledged? 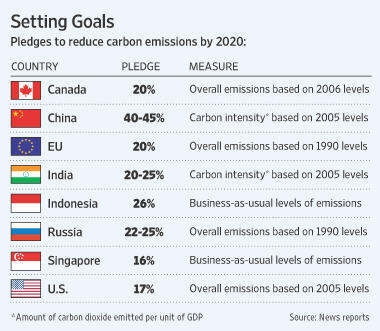 Well China has pledged to reduce their “carbon intensity” by 40-45%, and India has pledge 20-25% both by 2020. Carbon intensity means emissions per unit of production, so their overall footprint will undoubtedly rise in the future. What’s even more ridiculous is that Chinese officials have called our 17% pledge of reduction not good enough. Furthermore, any new agreements or protocols enacted at the conference will cost us billions per year. UN officials are looking for a minimum agreement of $10 billion per year to help developing countries adapt to global warming effects and institute cleaner technologies. The European Commission said in September that the costs to support developing nations could reach a staggering $150 billion per year by 2020. Since the United States Gross Domestic Product is nearly the size of the entire European Union, you can imagine what the world community would believe our fair share is to contribute. At a very minimum I would estimate our share to be comparable to our portion of world GDP, or around 25%. This could mean somewhere in the ballpark of 2.5 to 35 billion per year to support developing nations deal with the unproven phenomenon of manmade global warming. One might ask how President Obama can even be considering such agreements in today’s economic climate. Well, this is where the story actually gets worse. President Obama has long been a proponent of manmade global warming, and whole heartedly believes in the science behind it. So much that he said the science is proven and announced that he would push further for a Cap and Trade system to limit carbon emissions back on the campaign trail. (Please note that in 2007, Senate Republicans stopped the passage of the first Cap & Trade bill, named “America’s Climate Security Act of 2007.” Upon entering office, when most in the country still hadn’t even heard of Cap & Trade, Obama designated (December 2008) and the Senate confirmed (January 2009) Lisa Jackson to head up the Environmental Protection Agency, or EPA. First on her agenda, lay the groundwork for officially vilifying CO2 and in the process provide the Administration political cover in pursuing its agenda, all the while nudging Congress to finally enact a monumental Cap & Trade bill. 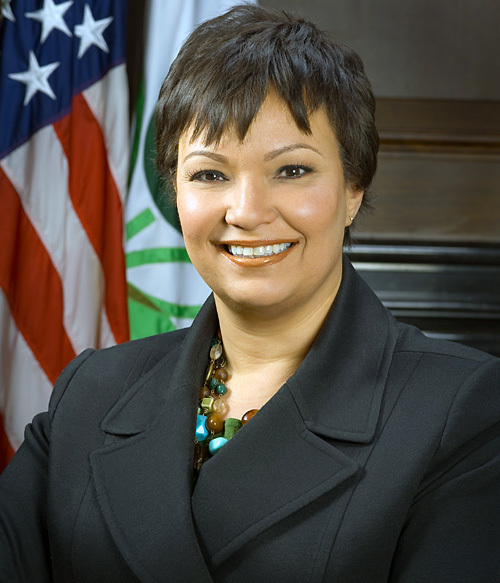 Not three months passed (April 2009) from her Senate confirmation as EPA Administrator, and Lisa Jackson issued an “endangerment finding” on greenhouse gases which found Carbon Dioxide to be a direct threat to public health and wellbeing. Less than three months after this specious issuance, Nancy Pelosi, along with her compassionate, wide-eyed and imaginative cohorts passed H.R. 2454 – American Clean Energy and Security Act 2009. What’d included in that bill? A plan to regulate economy-wide carbon emissions by, you guessed it, 17% by 2020. After the bill had already been passed in the House, it was revealed that the Cap & Trade power grab would cost Americans hundreds of billions of dollars per year. Since costs would rise across the board for all products and services, some estimates said the legislation would cost families upwards of $2,000 per year. So much for not raising taxes on the middle class. The Copenhagen Climate Conference does not hold many certainties. Will binding treaties be made, or will it be a feeble exercise of well-intentioned, enormously hypocritical folks, jet setting to a far off land in an attempt to save the world while emitting 41,000 tons of CO2 in the process? Will international praise in agreeing to lower carbon emissions be just what President Obama needs to turn the tide on his falling domestic support, or will his attempt to pledge money we don’t have for a crisis many don’t believe in on his way home from garnering an absurd Nobel Peace Prize won for potential finally awaken the American public to the incessant power grab that constitutes his administration? Will the main stream media finally do its job and look into the climategate scandal, or will the leftist’s agenda to exert more control over American’s choices and freedoms via carbon emissions standards come to fruition? This explains a lot! For a houseplant you are impressively learned and you write quite eloquently. Instead of trading barbs, I come to offer a real solution that will benefit everybody: Perhaps we could figure out a way to eliminate the pollution created by the carbon economy and offset the destruction caused by greenhouse gas emissions if we could just come up with a way to attach the mouths of all those who believe greenhouse gasses are harmless to the exhaust pipes of their SUVs and smokestacks of the world’s coal burning power plants? Even if this didn’t solve the global warming problem, it would surely solve a lot of others. Good post Dan, There is alot to talk about in here. I know you love debates and I heard about this one in Toronto. Although I haven’t found any videos of it. I think it is probably important to figure out what the chances are that cap and trade can pass through the Senate. I haven’t read anything that says are remotely close. We know that the last senate vote was grossly against kyoto like 90 to 10. Its hard to imagine Boxer being able to pull votes from democrats in coal dependent state such as IL, PA, IN, OH, or MO. Next, I find it very troubling the way the Administration handles this. This is probably your best example of Obama being a liberal trying to pass his agenda as opposed to a pragmatic president. This is not the time for him to be dealing with this unknown issue. Most importantly I would like to see some definitive evidence that would warrant these massive changes. This goes for health care too, shouldn’t the public be entitled to the “common knowledge” that we often hear as excuse for an overhaul? Tim i agree. So much jockeying is pure politickin and special interest…in.. Its tough to find the real answers no matter what the topic. I would also say that equally important to discussing the chances that Cap & Trade passes in the Senate, is enlightening people to this issue, and the absurdity displayed by its players. Seriously, the entire world is converging in Copenhagen, for what….. So we can pledge money for our anti-American, Jew-hating United Nations cohorts? Last i heard, there is still genocide going on all over Africa, Iranian protestors are finally uprising against their oppressive regime, Dictators are emerging in South America, just to mention a few. Its scary that the world gets together for this, I can think of about 43,765,357,542,227 things “the world” should focus on in its stead. Ive been saying for a while that i think these types of Debates will become more popular and turn into a form of sport.. Tensions seem to really rise about 9 months before the election, and now that Obama’s in office its only gotten worse..
One of the “skeptics” that apparently won that debate in Canada was Bjorn Lomborg. He had a good op-ed in WSJ a little over a week ago, that challenged the idea that melting glaciers are creating suffering, but that it was just the opposite, and more importantly citizens of developing nations are more concerned with fresh water, abundant food, and survival than combating unproven science.. Read this its good. I agree with you 100%, Our president believes that idea of Global Warming,it’s a Lie brought on by Al Gore,he is making a killing off of this,this guy is probably a millionaire by now. I fear for the future if cap and trade go through,taxes will go sky high food will become scarce,more jobs will be lost. God help us all. I know there has been talk of Al Gore becoming a climate change billionare.. Apparently through his companies hes made over a hundred million dollars.. ..
Its just weird that the left has a monopoly on “compassion”, yet they would spend billions on a theory that would profoundly hurt the world and our economy all the while mandating more and more individual behavior. I dont get it, we preach individual rights and responsibililty, small govt, lower taxes, and more freedom, but we’re the bad guy. Maybe “the World” should spend money on helping struggling countries update infrastructure so they can live in the modern world, or how bout mosquito nets for petes sake… Those alone would save more lives than a ridiculous leveling of carbon emissions ever would…. I figured I’d finally take a peek at your website and participate. 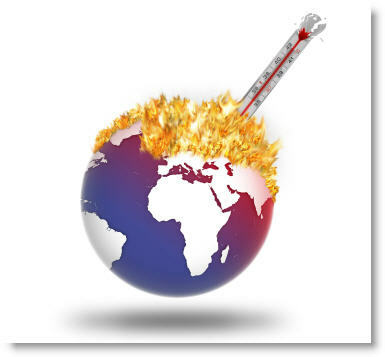 How many Americans actually have global warming in even their top 10 list of priorities? Watching the news and listening to the radio lately, you’d swear that global warming is the next y2k only worse; second only to healthcare, global warming seems to be one of the most discussed political issues of our time. What bothers me more than anything about the leaders of the global warming movement is the scare tactics that they use. What’s even scarier is that they’ve managed to successfully brainwash a significant number of people (still a small minority I think, but a significant sized group of people nonetheless) into believing that the world as we know it is on the verge of ending if we don’t act FAST. I’m sure government (public) school indoctrination on this issue isn’t helping either. One of the big questions I have is, why do the leaders of the movement have to resort to their scare tactics? I think the global warming nuts out there are actually doing more harm than good for the cause of reducing pollution and promoting alternative energy and energy independence. Instead of using global warming and the scare tactics associated with it as the vehicle for pushing their agenda, why not just reason with people, explaining the benefits of reduced pollution and energy independence? Seems to me like you could get a lot more people behind a common sense movement than a politically charged one. I’m all for reducing pollution and alternative energy, so long as its pursued in a common sense way and not done in the name of global warming. Oops, I mean “climate change.” Funny how the phrase has changed from global warming to climate change, I think its hard to sell global warming to Americans when the past 3 winters in the US have been some of the coldest on record.